A friend of mine gave me this awhile back and I didn’t think I would use it because I realy didn’t need the extra light. Well I guess I should have installed it earlier then I did. I have been using it for some time now and wonder how I cut without it before. I think it is a great accessory, I would say better then a laser light. I believe they run about 35 bucks and I would say well worth the investment. It is quite easy to install even for a knot head as myself. Although, it isn’t he brightest light it does put extra light on the wood to help mark a line and make it easier to see the cut line. The real advantage is that it puts a shadow of the blade onto the wood right where the blade is going to cut the wood. Its quite accurate, maybe not like a laser but pretty dang close and only because it isn’t as clear of a line. Once you get use to using it you won’t cut without it. It works great when you cut angles and when you are trying just to shave a little off the end. Well that’s all I got, it works great for me a real handy accessory. It only works on certain DW models, not sure exactly which ones but I have the DW718 and I believe it works on the 716 as well. I have it on my DeWalt and it works well. I find lowering the blade close to the work piece provides better alignment, I guess it is some form of parallax. 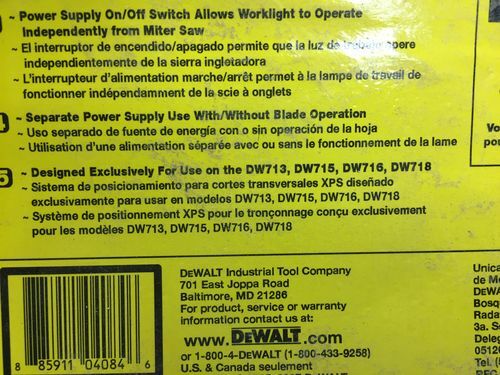 When I bought my DeWalt 12” (non-slider) several years ago the DeWalt website said this light would fit my saw, so I ordered it. Well lo and behold, it does NOT fit my saw. When I called for a return authorization they said they would be charging me a “return fee” and I’d have to pay the return shipping as well. The person I was speaking to kept insisting it would fit my saw, ,because she was looking at THEIR WEBSITE and it says it will fit. He let me holler for a minute or two, then he just calmly apologized and tried to tell me that the other gal was new and she didn’t know that the worklight would NOT fit my model. He also said the website was wrong and they had already reported it to their IT people so it could be fixed. He must have apologized 5 or 6 times for what the other operator had said that I had heard. He ended up sending me a UPS pickup label and when it got to my house there was also a 3-pack of 12” blades in the box. About 2 weeks later I saw they finally fixed the web site information. I found that to be true for sure, the closer to the board the better the line gets. Maybe giving it a bit too much praise but I have found it quite useful. You think they would had a little more tact, nicely done though getting yourself a few blades out of the deal. Well worth the hassle in the end. I also use it on my 12” non-sliding miter saw. I really like it in the garage. But when I used my saw outside when I built my shed, it was useless. At least I’m done with exterior for now! I prefer it to a laser, because it truly is the shadow of the blade, no calibration needed. Never thought about not working outside but mine never goes outside. I found what it says to be the saws it works on….no promises or refunds from me…. I had the laser on mine originally and it was an overpriced piece of poop, gimmick from day one. The laser only marks one side of the blade or the other, never stays in adjustment, and is NOT a very thin line for accurate cuts. I suppose if you are a framer and just need the kind of hackery accuracy I see from framers, then the laser is fine. The light I replaced it with is HEAVEN! I wish I had purchased it first! Shows BOTH sides of the blade and is razor sharp. Yes you are supposed to lower the blade to the work for alignment. Totally worth the money. What I also like is that you see the teeth of the blade, so you know exactly where the cut is.